Daylight is becoming noticeably shorter this time of year, and now that Daylight Savings Time has ended, most people will be coming home from work in the dark. Options for lighting have come so far, you can customize your lighting inside and outside for safety, convenience and aesthetics. Motion-sensor lighting has come a long way, and many have bright, long-lasting LED’s, timers, and motion sensitivity settings. Battery-operated lights are the easiest to install and can be placed virtually anywhere. Use them where you park when you come home, near walkways, as well as the entryway. Stylish motion sensor lamp posts are perfect for integrating into the landscaping, as they look great besides offering some security. For your garage entry, install wall sconces on either side of the door, or one light over the door, shining downwards. Motion sensors or smart lighting that come on when you drive up are best. 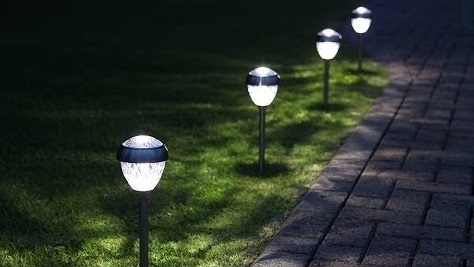 Solar stake lights are perfect for your landscaping or walkway, but instead of a straight line of lights, place them in various places among plantings to add some interest. When it’s dark, the low wattage of the solar lights will provide enough light for you to see well. Install step or stair lights for the amazing look, as well as safety. Add them along the sides to the railing, or on the risers. If your entryway is covered with a porch, place a lamppost near the steps or install lighting on the porch posts closest to the steps, or consider adding an overhead fixture to the porch ceiling to light up the entire area. Depending on the placement of your light fixtures, make certain the types you choose are going to be able to take the elements. A light with a UL damp rating is best under a covered area, and one with the UL wet rating can handle harsh weather conditions like direct sunlight, rain and even saltwater spray. As noted above, some lighting needs to be motion-sensored, but others can be managed by timers, while solar lighting usually has sensors to come on when it’s dark and turn off at daylight. The type of bulb you use is a personal choice, but keep in mind that if you’re going to be using the lights all night, LED’s use far less energy, and last much longer than other types, saving you money and time. Don’t let the memory of the harsh glare LED’s gave off when they were first produced; their technology has come a long way and the industry has taken great strides to give consumers softer, more pleasing light. Before adding bright security lighting that can affect the homes next door, talk with your neighbors, as they’ll appreciate you consulting with them. You need to make certain you won’t be disturbing their rest or have your lights shining into their windows. Not only do you want to have lighting outside for security, but for the ambience as well. A nicely-lit home looks inviting and adds to the style of your home.